Certification exam Practice exam CNA Video Feel free to ask questions at any point. 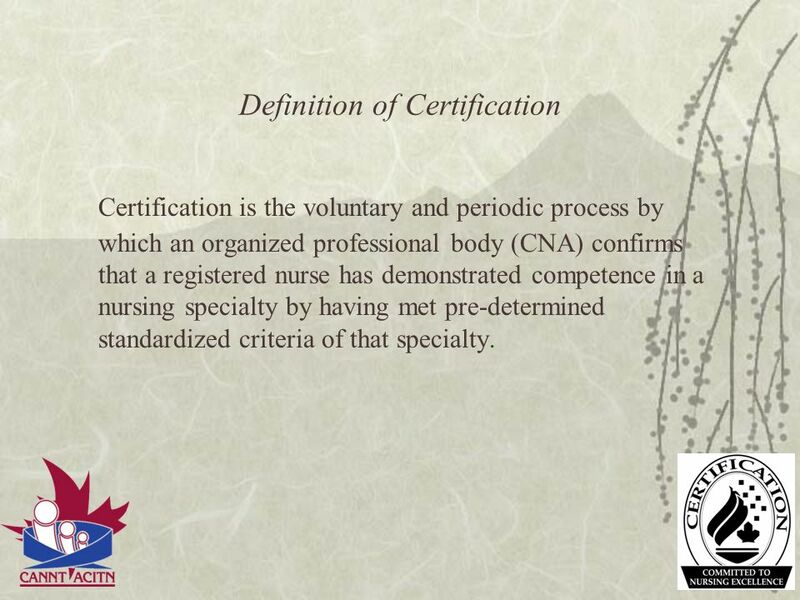 Certification is the voluntary and periodic process by which an organized professional body (CNA) confirms that a registered nurse has demonstrated competence in a nursing specialty by having met pre-determined standardized criteria of that specialty. Continuous learning requires nurses to reflect on their competencies in relation to the changes occurring in society and the health care environment and, as a result of that reflection, take action to acquire and develop new competencies. 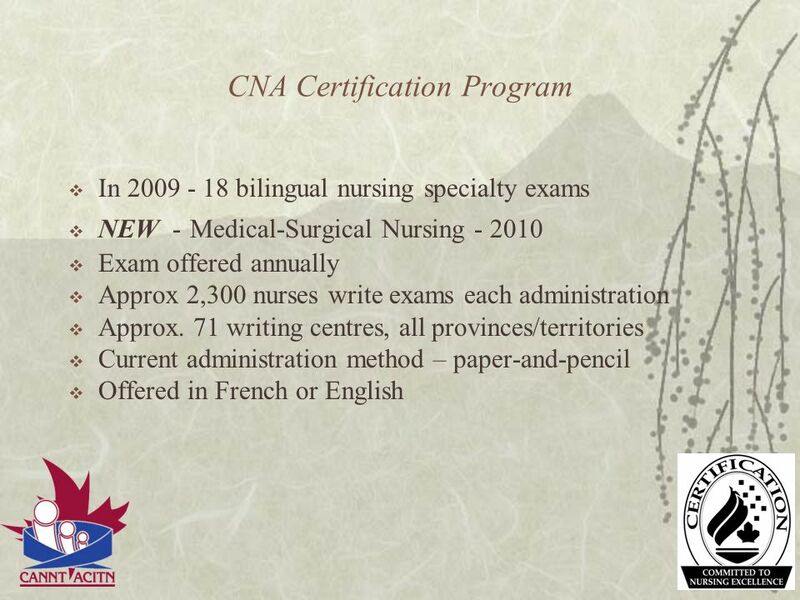 (CNA Joint Position Statement, 2004) This not only holds true for individual practice but also for the CNA certification process as well. 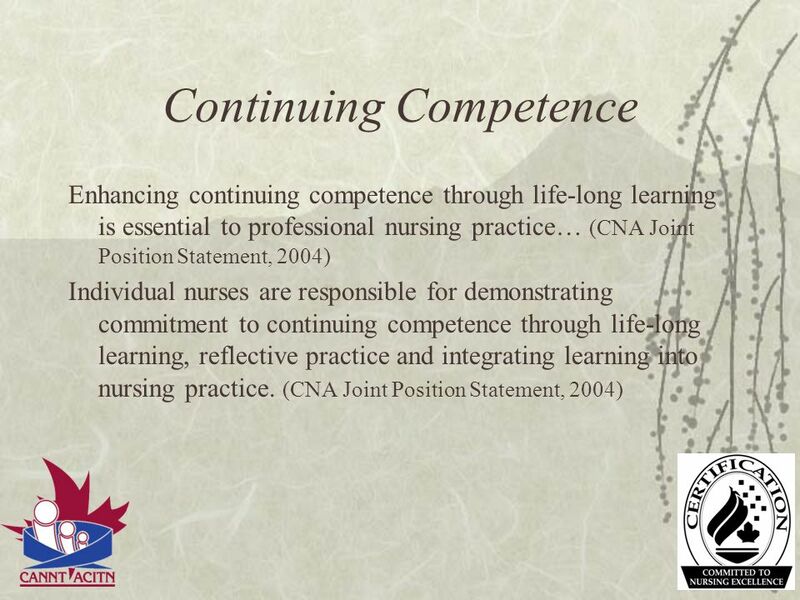 Competencies are continually being revised. Questions are developed and eliminated on a continual basis to reflect changing competencies. Take supplies (snack, water, pencils, erasers) Bring identification Go to the bathroom Try to stay calm Brain won’t function without fuel. 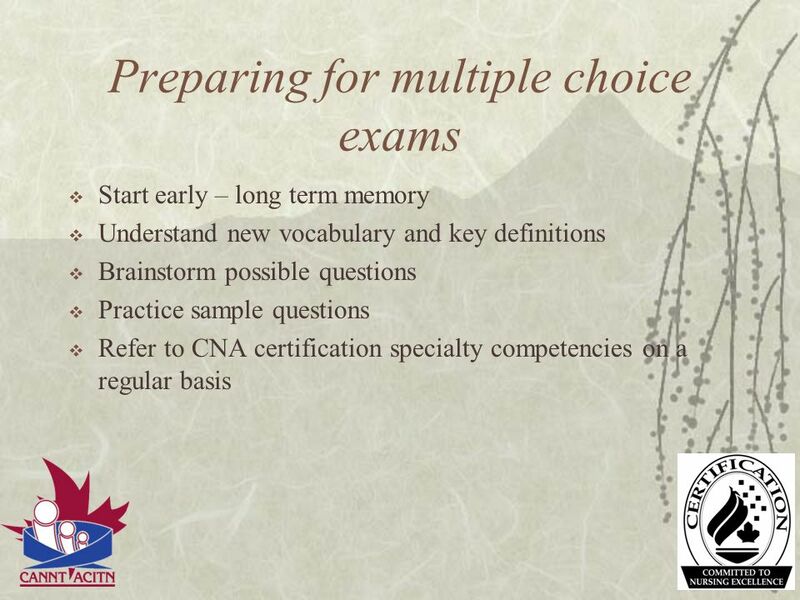 Won’t be able to concentrate if your hypoglycemic Plan for delays, trying to find your way around a strange location I don’t know about you but I more in control when I/’m not rushed or overly stressed CNA requires ID read your prep guide for details You might think this is funny but go to the bathroom before they open the doors to the exam room. The exam won’t start until the majority of the writers are in the ;room. If they invigilators are continually doing a head count the exam won’t start. Information and instructions need to be given out before starting to write and once the exam begins you aren’t allowed to leave the room for the first 30min. 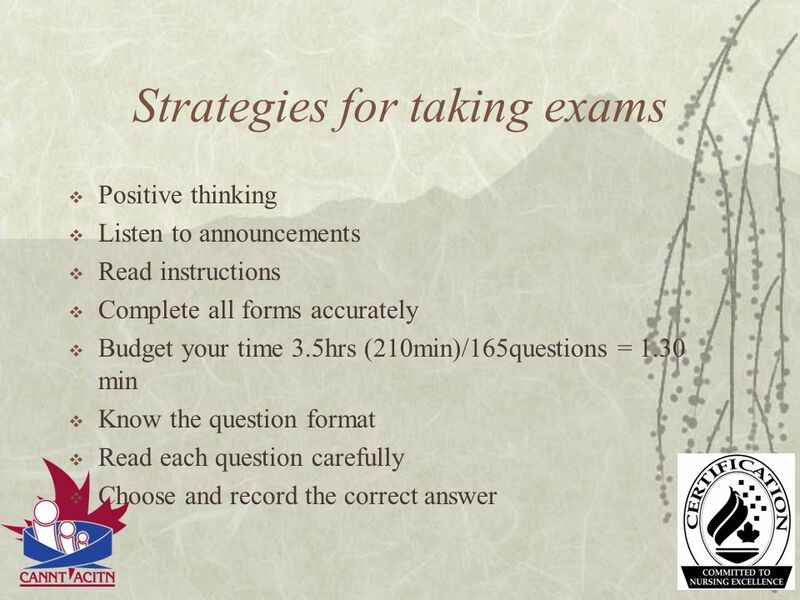 Positive thinking Listen to announcements Read instructions Complete all forms accurately Budget your time 3.5hrs (210min)/165questions = 1.30 min Know the question format Read each question carefully Choose and record the correct answer Don’t underestimate the power of positive thinking. If you’ve studied you should do well. Try to focus on what’s being said in the instructions. 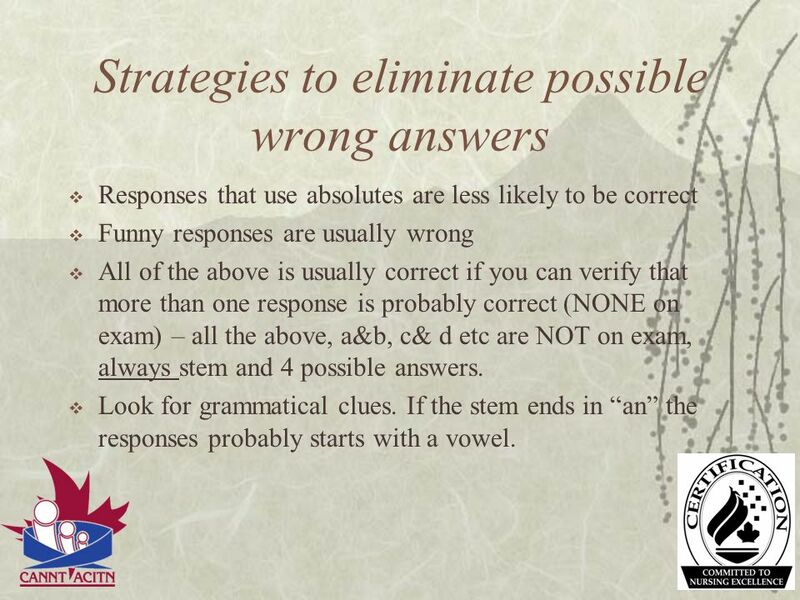 If you’re not sure ask.. More mistakes are made because people don’t read the instructions or questions correctly. I’ve done it many times usually because I’m trying to rush through something or \I'm nervous. 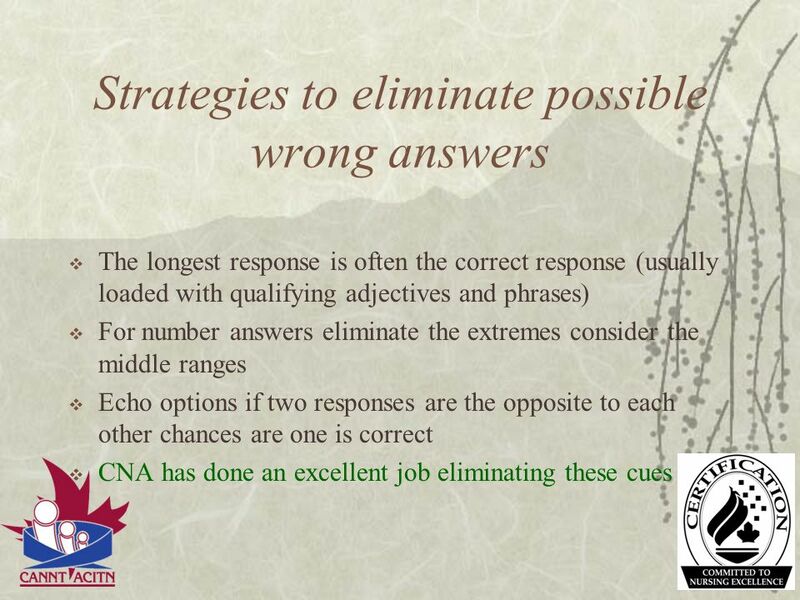 Don’t spend enormous amounts of time on a question your not sure about leave it and come back to it later. Make a note to do so. 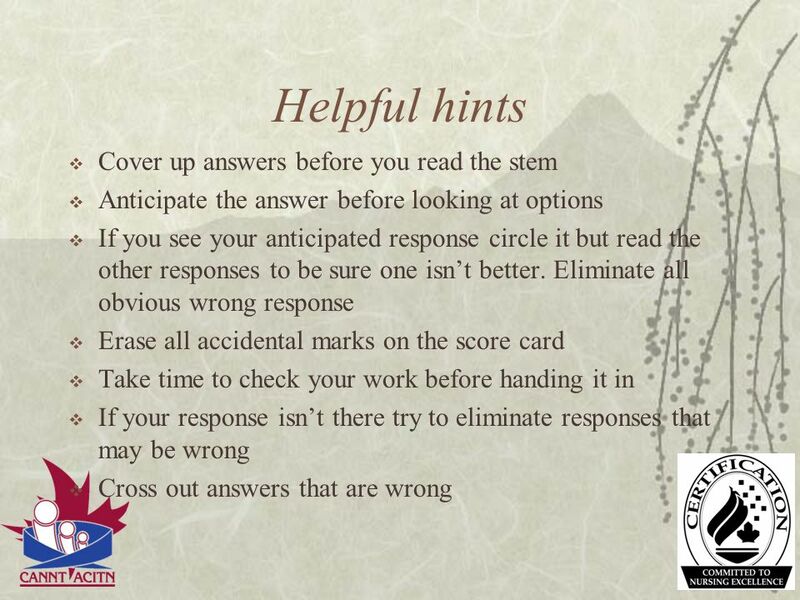 If you skip a question make extra sure you mark the correct answers to subsequent questions. 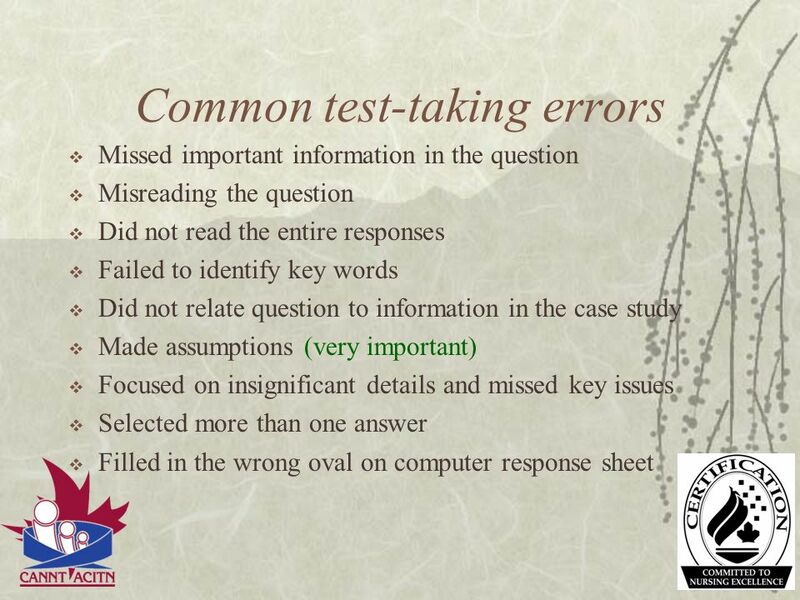 Missed important information in the question Misreading the question Did not read the entire responses Failed to identify key words Did not relate question to information in the case study Made assumptions (very important) Focused on insignificant details and missed key issues Selected more than one answer Filled in the wrong oval on computer response sheet Misreading the question. Not seeing a key word All responses except. Or you missed an important lab value that would have changed your response. 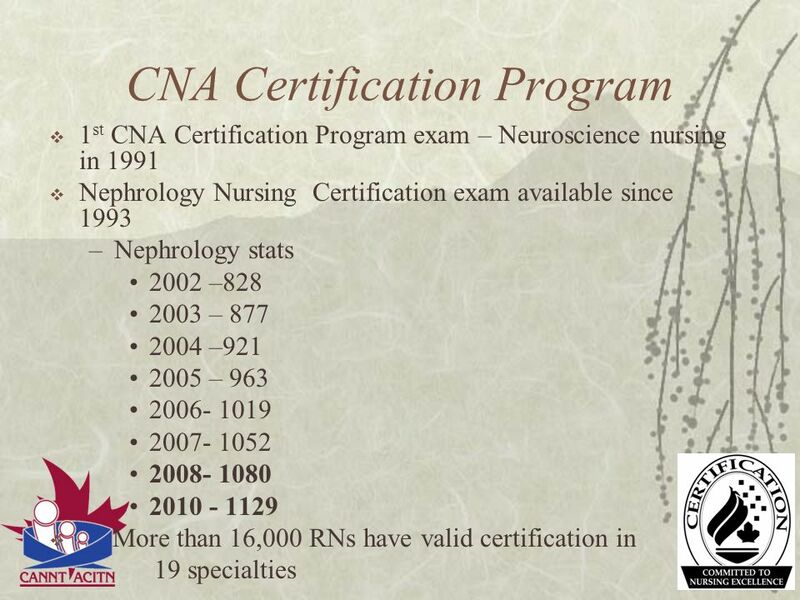 Made assumptions I hear this especially from nurses who have been in nephrology for many years. But what if the patient had this. If it wasn’t stated in the stem of the question don’t assume its taking place. I’ve seen nurses feverously erasing answers at the very last minute because they missed an oval on the answer sheet and now all the responses are one question off. 28 Knowledge Tests your cognitive ability to recall learned material and to understand its meaning Identify effects of drugs Select correct facts, concepts, principles or procedures 15 – 25 % of questions What are the two modalities of dialysis? 29 Knowledge Example In cardiopulmonary resuscitation which of the following actions should the nurse take first? 30 Knowledge Example In cardiopulmonary resuscitation which of the following actions should the nurse take first? Assess the carotid pulse Verify that the patient is unresponsive. Place the patient on a hard, firm surface Implement the head-tilt, chin lift maneuver. ANNIE ANNIE can you hear me? 31 Knowledge Answer In cardiopulmonary resuscitation which of the following actions should the nurse take first? 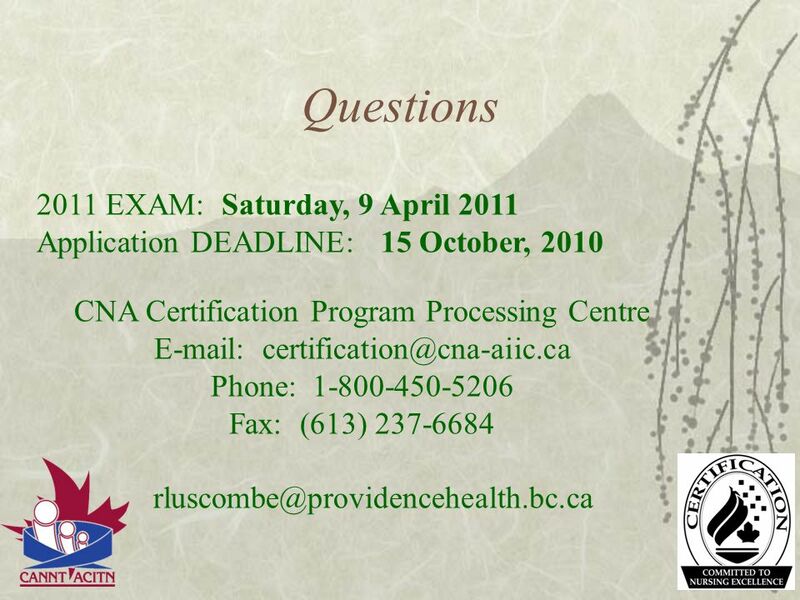 Assess the carotid pulse Verify that the patient is unresponsive. Place the patient on a hard, firm surface Implement the head-tilt, chin lift maneuver. 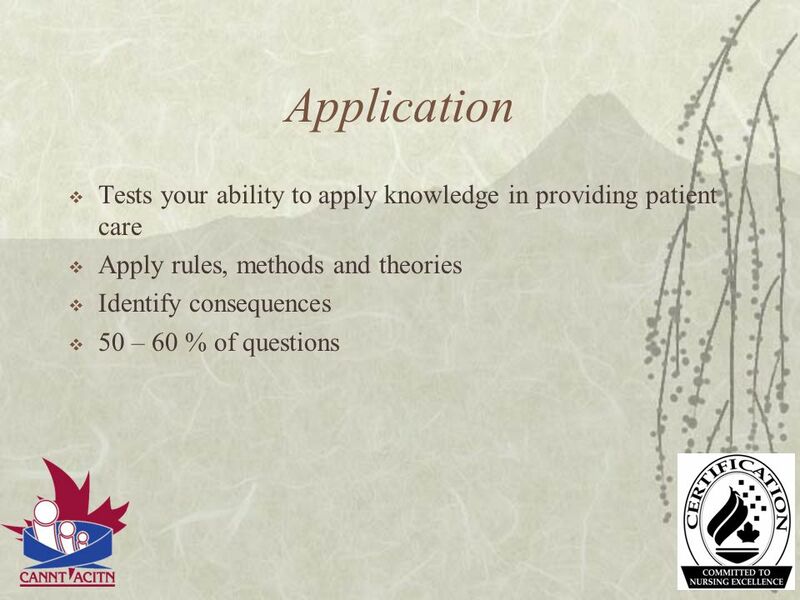 32 Application Tests your ability to apply knowledge in providing patient care Apply rules, methods and theories Identify consequences 50 – 60 % of questions Air in a hemodialysis dialyzer will? Clot the circuit, decrease clearances. 33 Application Example Jamie is a 10 year old boy who received a deep laceration to his scalp when he fell off a play structure. The nurse assesses that Jamie's injury will require suturing by the physician.Which one of the following interventions should be taken by the nurse to promote tissue integrity? 34 Application Example Jamie is a 10 year old boy who received a deep laceration to his scalp when he fell off a play structure. The nurse assesses that Jamie's injury will require suturing by the physician.Which one of the following interventions should be taken by the nurse to promote tissue integrity? Allow the laceration to remain open to the air until the suturing can be completed. After cleansing the injury, apply a sterile dressing until the suturing can be completed. 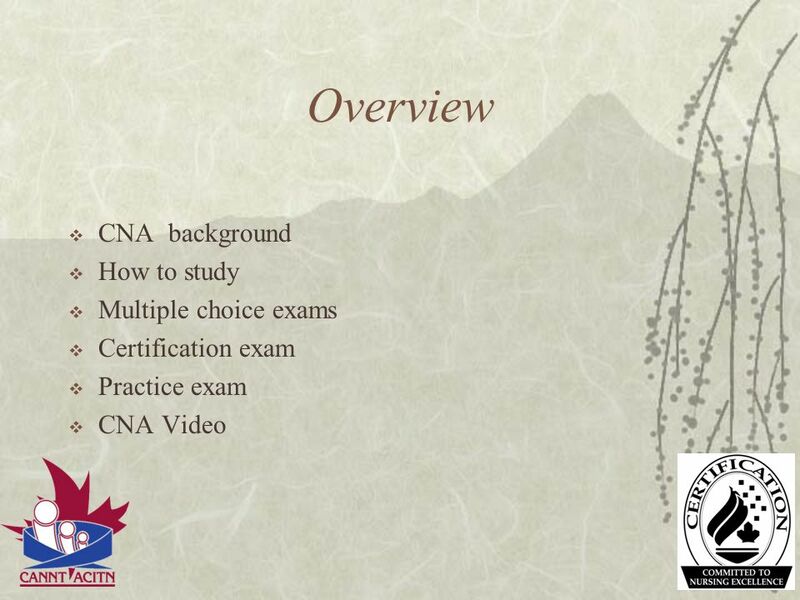 Observe the site for 24 hours to assess the extent of injury before preparation for suturing. Leave the original pressure dressing in place for at least three hours to prevent hemorrhage. 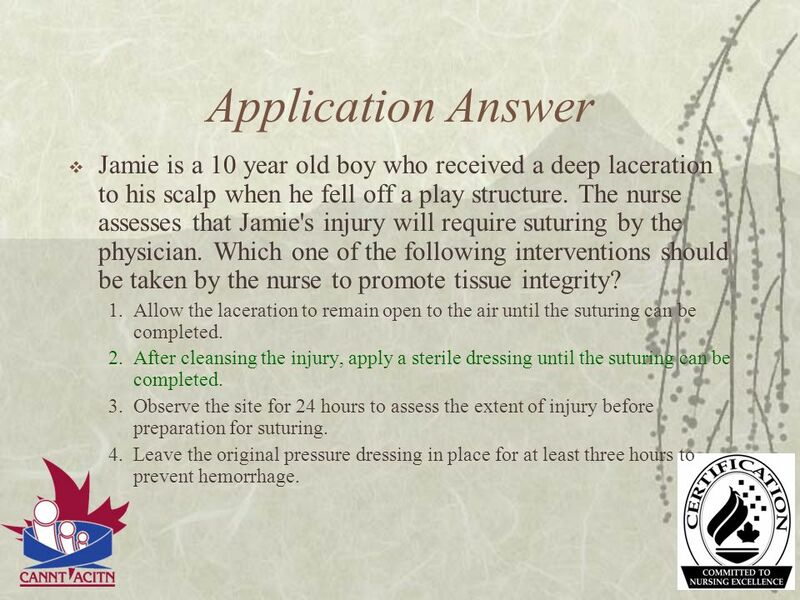 35 Application Answer Jamie is a 10 year old boy who received a deep laceration to his scalp when he fell off a play structure. The nurse assesses that Jamie's injury will require suturing by the physician. Which one of the following interventions should be taken by the nurse to promote tissue integrity? Allow the laceration to remain open to the air until the suturing can be completed. After cleansing the injury, apply a sterile dressing until the suturing can be completed. Observe the site for 24 hours to assess the extent of injury before preparation for suturing. Leave the original pressure dressing in place for at least three hours to prevent hemorrhage. Mrs.Carson, 70 years old, is recovering from day surgery. She has been tolerating oral fluids. At 1600 hours, the nurse goes into Mrs. Carson’s room to discontinue her IV and observes her vomiting. Which of the following interventions is the most appropriate initial action for the nurse to take? Mrs.Carson, 70 years old, is recovering from day surgery. She has been tolerating oral fluids. At 1600 hours, the nurse goes into Mrs. Carson’s room to discontinue her IV and observes her vomiting. Which of the following interventions is the most appropriate initial action for the nurse to take? Administer an antiemetic and discontinue the IV. 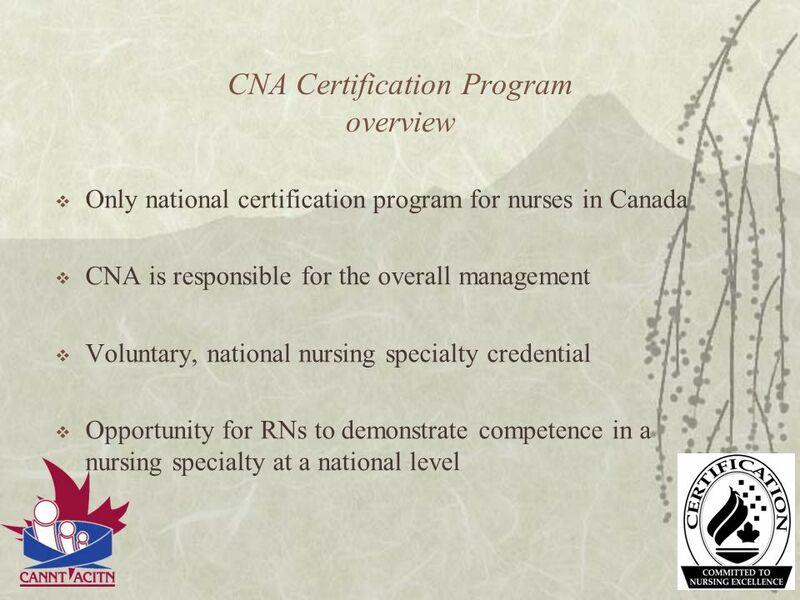 Maintain the IV infusion and prepare for possible admission Continue with discharge plans and make a home care referral. Notify Mrs. Carson’s family that there have been complications. 43 What do I study? Do practice questions Where are you struggling? Where are your gaps in knowledge? What are you unfamiliar with? What areas of nephrology are you unfamiliar with? Practice exam questions and answers are from the CNA Nephrology Nursing Certification Exam Prep Guide, 2nd edition, 2002. 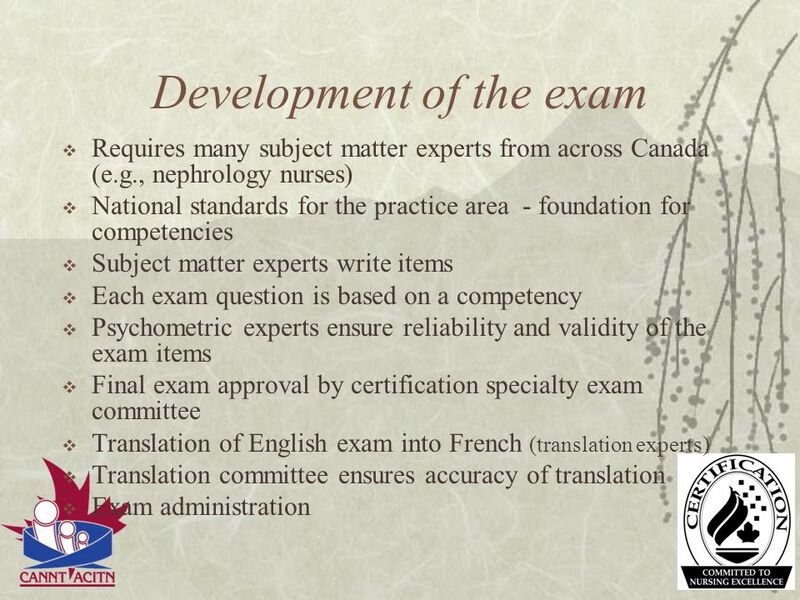 So now we’re going to do a practice exam. I’ll give instructions I’ll let you know when you have 15 min remaining, 10 and 5. Then we'll go over the responses. You won’t have to hand these in. Your responses may give you some indicationn where your strengths and weakness lie. 45 Case 1 Mr. Smith, 34 years old, presents to the nephrology outpatient clinic. Mr. Smith informs the nephrology nurse that he had an arteriovenous fistula created in his left forearm 10 days ago. Questions 1 to 5 refer to this case. 46 Question 1 What approach should be considered as conservative management therapy for Mr. Smith? Implement an unrestricted fluid intake. Review his dietary potassium intake. Initiate twice weekly hemodialysis treatments. Implement an unrestricted protein intake. 1. Conservative management includes fluid restriction to avoid fluid buildup. 2. 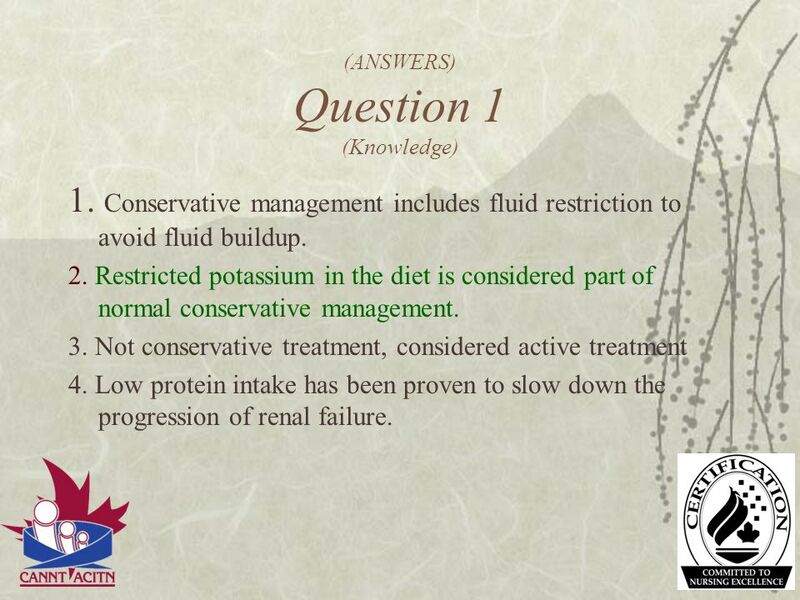 Restricted potassium in the diet is considered part of normal conservative management. 3. Not conservative treatment, considered active treatment 4. Low protein intake has been proven to slow down the progression of renal failure. 48 Question 2 What finding is most important for the nephrology nurse to document about the initial assessment of Mr. Smith’s access condition? Patency of access Estimation of the blood flow through the fistula. Access recirculation test results The progression of his fistula arm exercise program. Assessment of the bruit and thrill is essential for access assessment. Can only be done via invasive techniques. Would only be done once hemodialysis has been initiated. Fistula arm exercising may not have started yet. Fistula is only 10 days old. Usually starts when sutures are removed (10-14 days). 50 Question 3 What assessment findings support a nursing diagnosis of infection related to fistula creation? Absence of bruit. Redness at the suture line. Swollen fistula arm. Numbness in the hand of the fistula arm. Not indicative of infection; fistula may be clotted but not infected. One of the cardinal manifestations of any infection. Can normally occur postoperatively for access creations or insertions, but not indicative that infection is present. Not indicative of an infection, but could indicate circulatory problems. 52 Question 4 Mr. Smith’s serum creatinine has increased significantly. A decision was made, in collaboration with the nephrologist, to begin hemodialysis within a month. 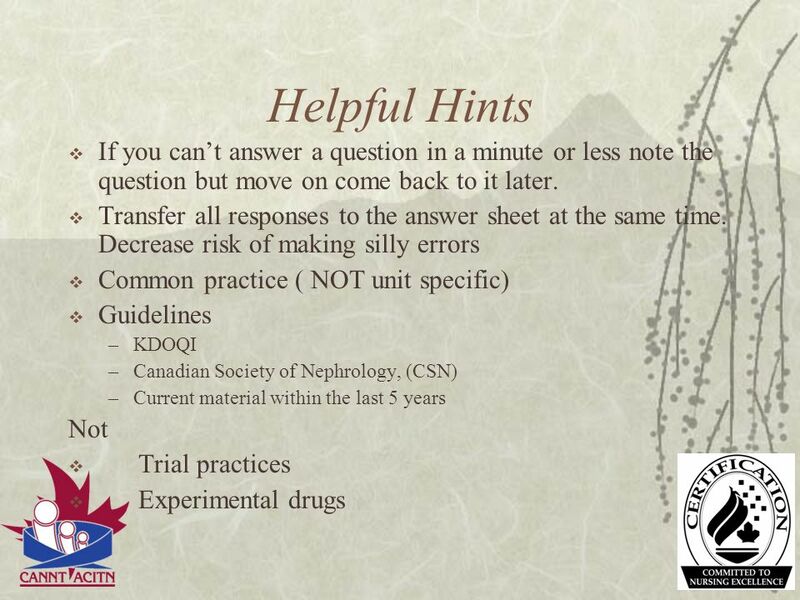 What should the nephrology nurse do? Discuss the long-term complications of kidney disease with Mr. Smith. 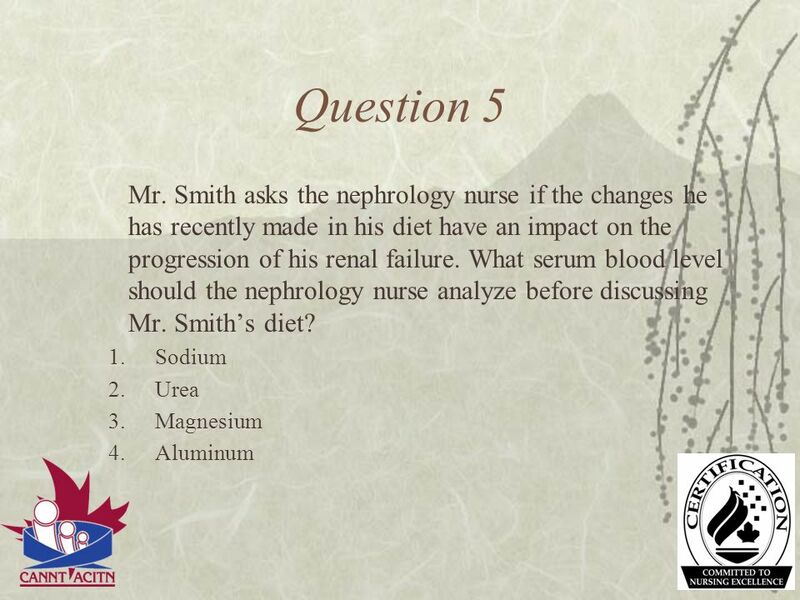 Reinforce the basic principles of hemodialysis with Mr. Smith. Review the basic anatomy of the kidney with Mr.. Smith. Review the pathophysiology of bone disease with Mr. Smith. Sodium is more an indication of fluid balance. Urea is the waste product of protein breakdown and a good indicator of how well the patient is controlling the protein in his diet. Not appropriate to monitor the conservative dietary management of a patient. Not appropriate for the assessment of conservative dietary management. 56 Case 2 Ms. Haze, 62 years old, has been on continuous ambulatory peritoneal dialysis (CAPD) for 3 years. Following four episodes of peritonitis in the past 6 months, Ms. Haze had a fistula created and is scheduled to begin hemodialysis tomorrow. 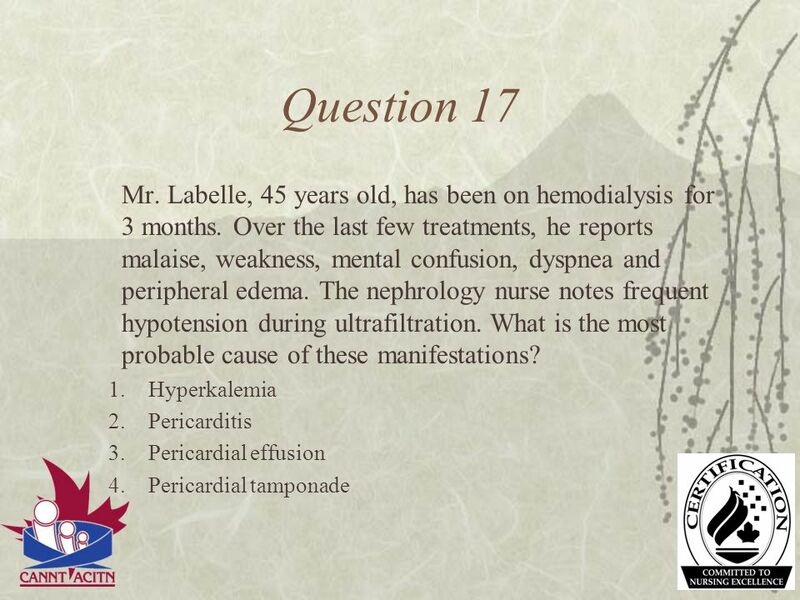 Questions 6 to 8 refer to this case. Dyspnea is indicative of air embolism, not hypotension. Therefore, ultrafiltration is not a factor. To determine whether air is present in the system. Blood flow rate would not be maintained with air embolism; need to stop immediately. The dialyzer coefficient would not affect the patient in this way. 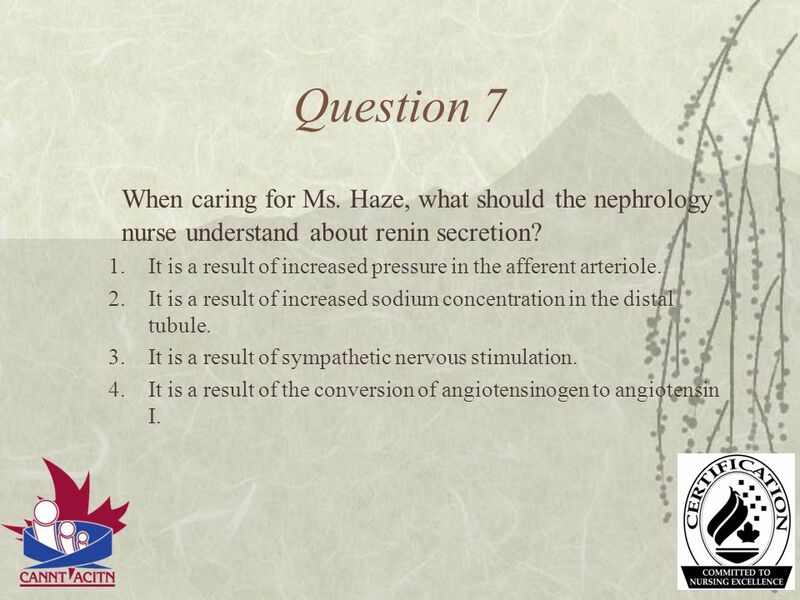 59 Question 7 When caring for Ms. Haze, what should the nephrology nurse understand about renin secretion? It is a result of increased pressure in the afferent arteriole. It is a result of increased sodium concentration in the distal tubule. It is a result of sympathetic nervous stimulation. It is a result of the conversion of angiotensinogen to angiotensin I. 60 Question 7 (Knowledge) It is due to decreased pressure in the afferent arteriole. It is a result of decreased sodium concentration in the distal tubule. Epinephrine and norepinephrine constrict the afferent arterioles and decrease blood flow; renin is secreted in response to the decreased pressure. This is an action of renin, not a stimulus that causes renin secretion. 61 Question 8 Ms. Haze has been prescribed nifedipine (Adalat XL). What should the nephrology nurse consider when providing instructions to Ms. Haze regarding this medication? It is a vasoconstrictor and is substantially removed by hemodialysis. It is a calcium channel blocker and may decrease peripheral vascular resistance. It is a beta blocker and may cause postural hypotension It is an angiotensin-converting enzyme (ACE) inhibitor with a prolonged plasma half- life in renal failure. 62 Question 8 (Knowledge) It is calcium channel blocker, not a vasodilator. It may cause regression of left ventricular hypertrophy, improving diastolic dysfunction. It is a calcium channel blocker, not a beta blocker. It is a calcium channel blocker, not an angiotensin-converting enzyme inhibitor. 63 Case 3 Mrs. Chin, 64 years old, had a peritoneal catheter inserted 2 weeks ago. She arrives at the home dialysis unit for training. Questions 9 to 13 refer to this case. Daily showers are not recommended until the site has completely healed (4-8 weeks) Ointments are only used if prescribed by the physician. Patients must be aware of manifestations so that therapy can be initiated Exit site care need not be sterilized daily. Weight loss will occur. Hypotension will occur. Tachycardia and hypotension will occur. Hypotension and tachycardia will occur. 68 Question 11 Mrs. Chin has been started on a renal multivitamin. Why should Mrs. Chin use this medication? Fat-soluble vitamins are lost in the dialysate. Vitamin deficiencies are due to poor intake. Water-soluble vitamins are lost in the dialysate. Vitamin deficiencies are due to decreased absorption rates. Water soluble vitamins are lost in dialysate. This is not the best answer. Correct answer. Vitamin deficiencies can be caused by interference with absorption by some drugs. 70 Question 12 Mrs. Chin returns to the clinic for her first monthly visit. Blood work reveals that her potassium level is 3.0mmol/L. 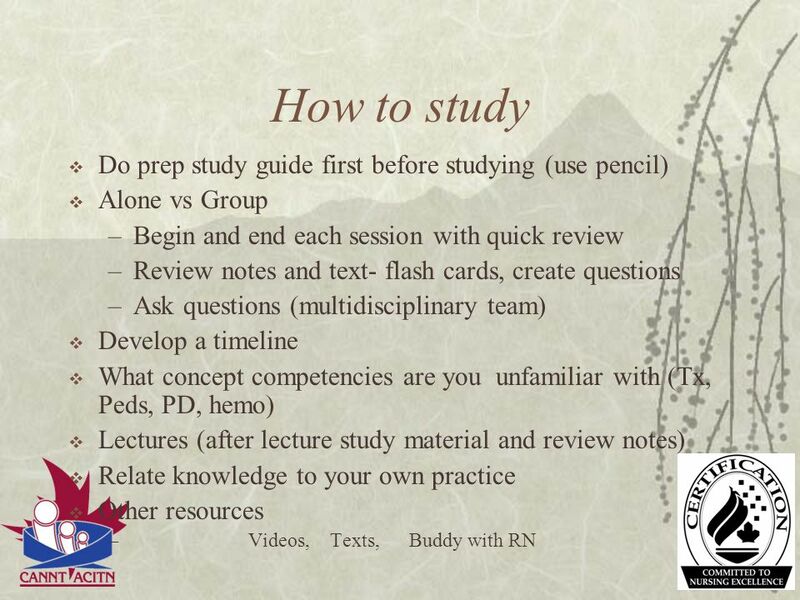 What should the nephrology nurse do? Ask the physician to order intraperitoneal potassium chloride. Advise Mrs. Chin to eat more bananas and oranges. 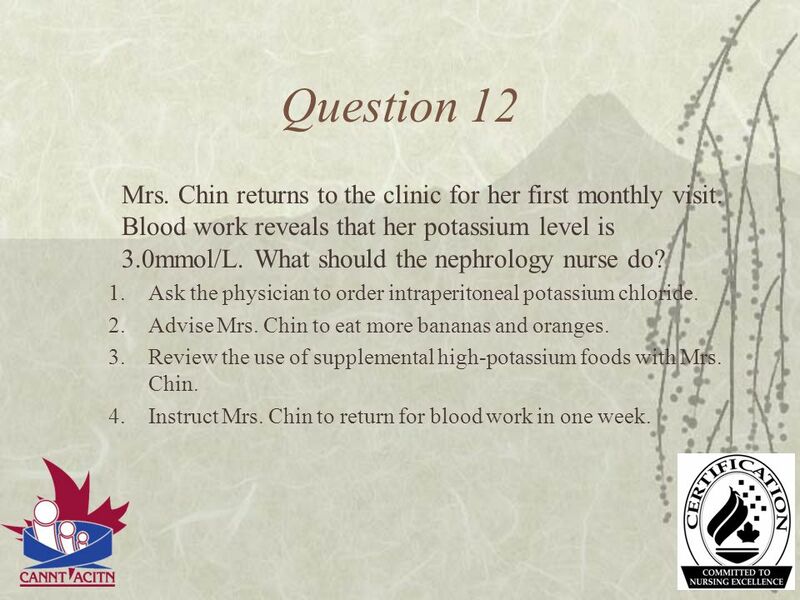 Review the use of supplemental high-potassium foods with Mrs. Chin. Instruct Mrs. Chin to return for blood work in one week. The nephrology nurse should report the potassium levels, but intraperitoneal medications are an added risk. Mrs. Chin needs to know how many oranges and bananas to eat. The first choice should always be to increase potassium in the diet. The dietitian is more qualified to recommend amounts. Need to review first. Treatment changes need to be immediate. 72 Question 13 Mrs. Chin reports that she is eating well but continues to lose weight. Her serum albumin is reported at 29g/L. 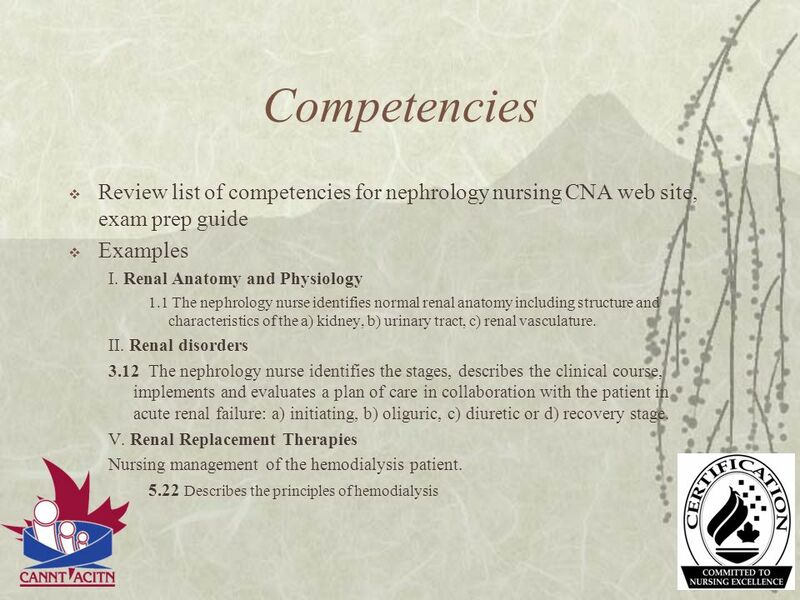 What should the nephrology nurse do initially? Recommend protein supplements Transfer Mrs. Chin to hemodialysis treatments. Collect a 24 hour urine sample for protein. Alter the peritoneal dialysis prescription. 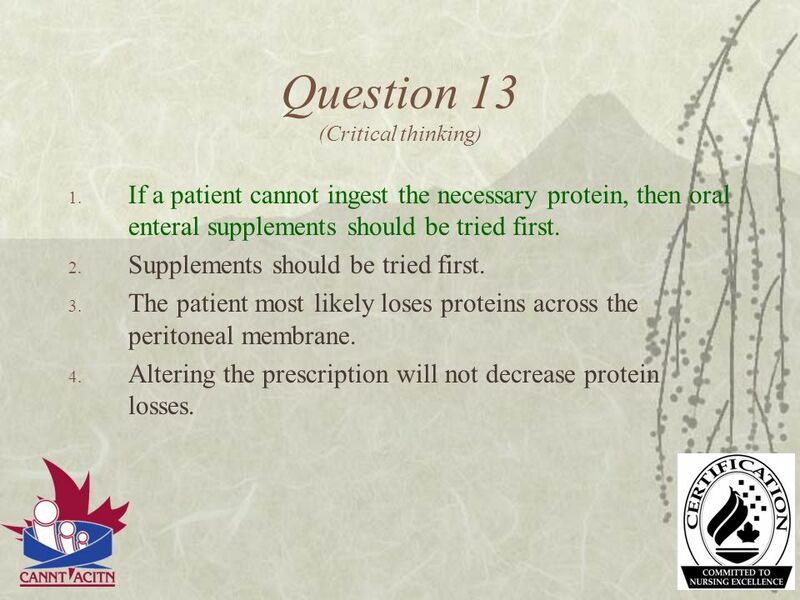 If a patient cannot ingest the necessary protein, then oral enteral supplements should be tried first. Supplements should be tried first. The patient most likely loses proteins across the peritoneal membrane. Altering the prescription will not decrease protein losses. 74 Question 14 Mr. Crane, 67 years old, received a renal transplant 3 weeks ago. He asks the nephrology nurse why he must have his blood checked so often. Which one of the following responses would be most appropriate? “Your cyclosporine levels need to be checked because high levels may harm your new kidney” “I will consult with your physician regarding a decrease in the number of times your blood needs to be checked.” “ Your Imuran may increase your white blood cell level”. “ As long as your have your transplant, we will need to check your blood frequently”. 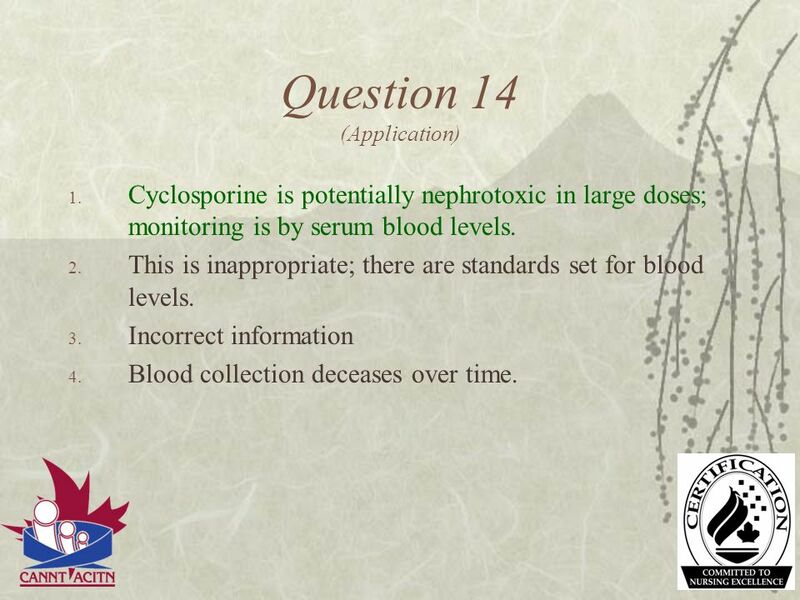 Cyclosporine is potentially nephrotoxic in large doses; monitoring is by serum blood levels. This is inappropriate; there are standards set for blood levels. Incorrect information Blood collection deceases over time. 76 Question 15 Kyle, 2 years old, received a cadaveric renal transplant 2 weeks ago. His serum creatinine has risen sharply and he is febrile. Which of the following statements accurately describes the acute rejection process for Kyle? Acute rejection is primarily humorally mediated (B lymphocytes). The onset is gradual. Acute rejection is primarily humorally mediated (B lymphocytes). The onset is sudden. Acute rejection is primarily cellular mediated (T lymphocytes). The onset is sudden. Acute rejection is primarily cellular mediated (T lymphocytes). The onset is gradual. This defines hyperacute rejection. Relates to hyperacute rejection. Acute rejection is cellular mediated and is treatable. Rejection is treatable, but graft may not be lost. Patients with high ultrafiltration transport characteristics have rapid absorption of glucose and dissipation of the osmotic gradient and, therefore, problems with fluid removal. 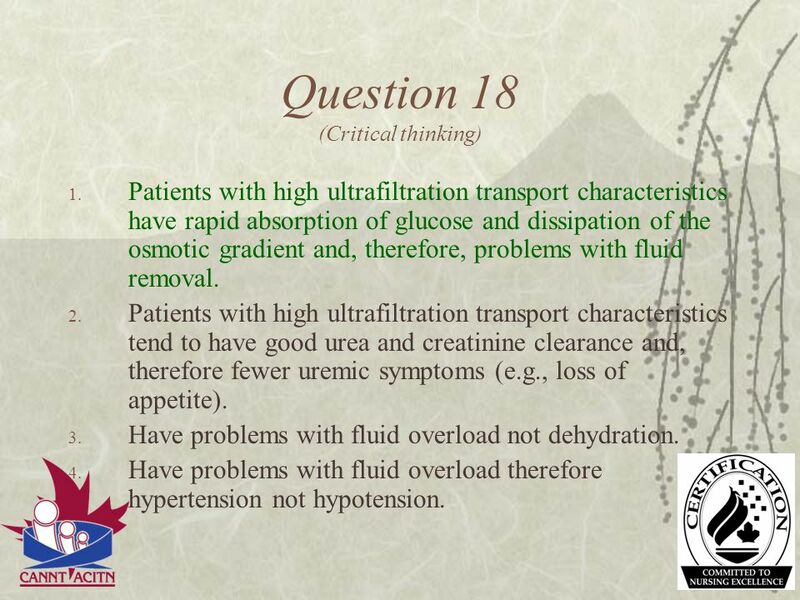 Patients with high ultrafiltration transport characteristics tend to have good urea and creatinine clearance and, therefore fewer uremic symptoms (e.g., loss of appetite). 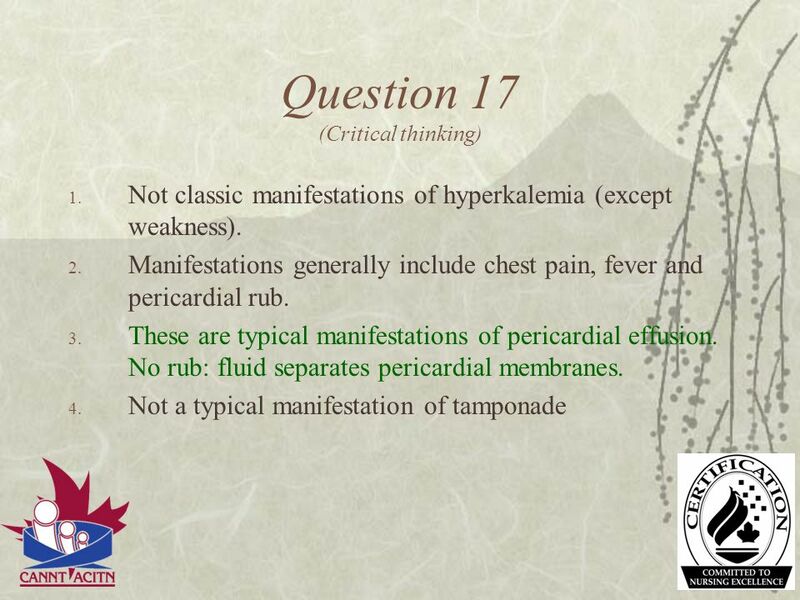 Have problems with fluid overload not dehydration. Have problems with fluid overload therefore hypertension not hypotension. 85 Question 19 (Knowledge) Renal arteriogram shows whether or not the vessels of a kidney are suitable for donation. Abdominal scans offer no information that would help in assessing suitability for kidney donation. Allergy testing offers no information that would help in assessing suitability of kidney donation. 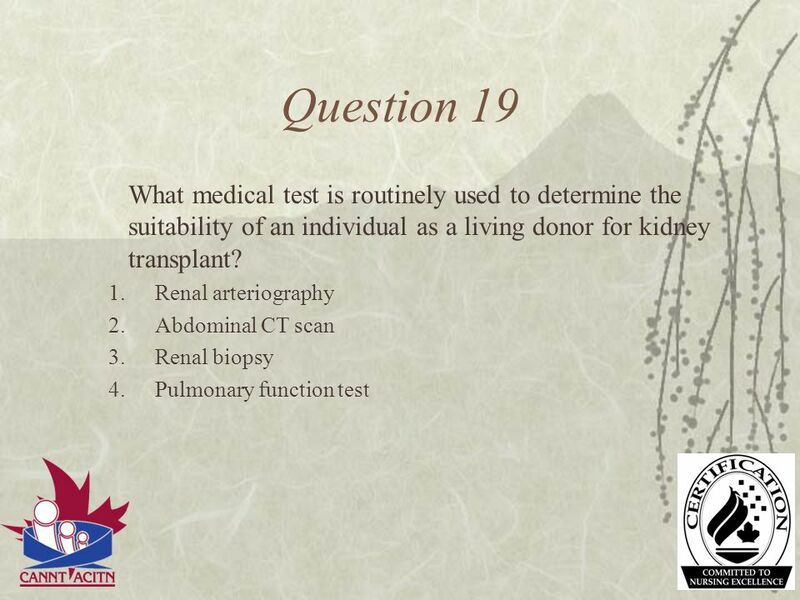 Pulmonary function tests offer no information that would help in assessing suitability for kidney donation. 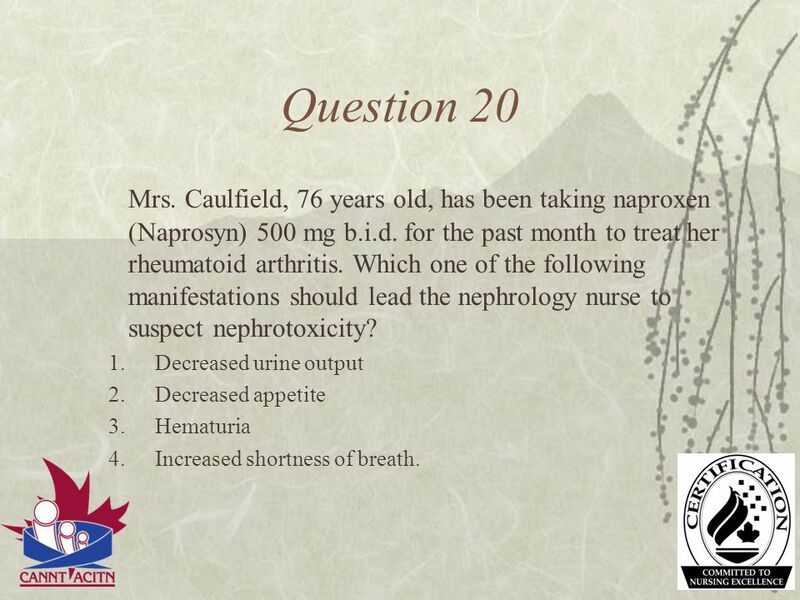 86 Question 20 Mrs. Caulfield, 76 years old, has been taking naproxen (Naprosyn) 500 mg b.i.d. for the past month to treat her rheumatoid arthritis. Which one of the following manifestations should lead the nephrology nurse to suspect nephrotoxicity? Decreased urine output Decreased appetite Hematuria Increased shortness of breath. Not an indicator of nephrotoxicity. Incorrect Is a manifestation of nephrotoxicity of naproxen. May be due to other contributing factors. 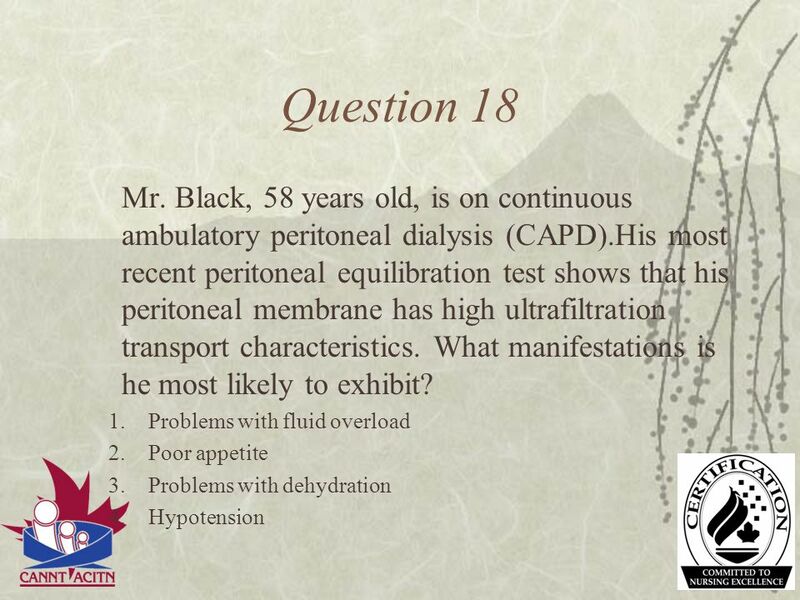 88 Question 21 Mr. Fry is on peritoneal dialysis using a 2.5% solution. During a clinic visit, he states that he needs to drink more. His weight has decreased and he is hypotensive. What should the nephrology nurse do? Talk to Mr. Fry about the complications of excess fluids. Suggest that Mr.. Fry changes the dextrose solution to 1.5% to help decrease his thirst. Suggest that Mr. Fry increase his kilojoules intake to increase his weight. Suggest that Mr. Fry decreases the number of his exchanges to decrease output. Excess fluids may cause complications, but he is thirsty because he is dehydrated. The higher concentration of dextrose is taking off too much fluid, as shown by a decrease in blood pressure and an increase in thirst. Weight loss is caused by fluid loss. Not a true statement. 90 Question 22 What statement best describes the etiology of altered red blood cell production with renal failure? Blood loss occurs in hemodialysis patients only. There is a decreased stimulus for red blood cell production due to an increase of erythropoietin The decreased survival time of red blood cells is due to an increase in uremic toxins Preformed antibodies from transfusions alter red blood cell production. 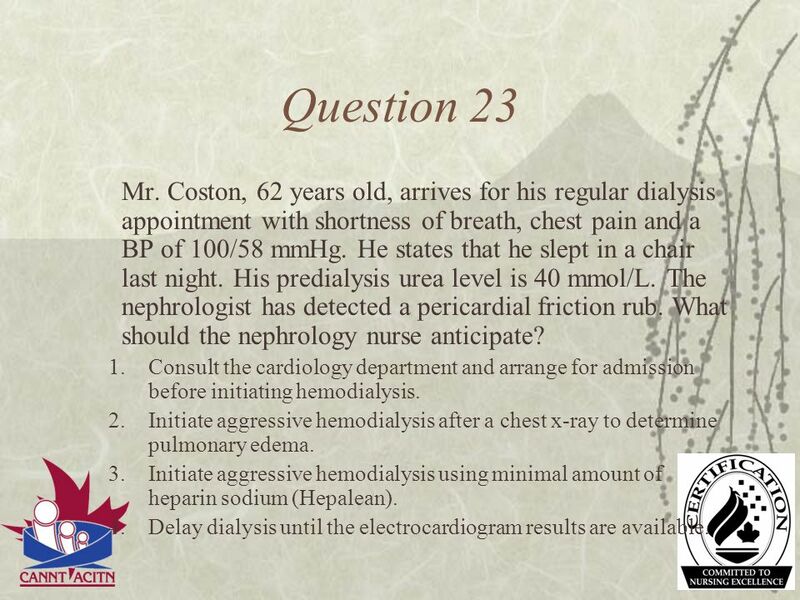 92 Question 23 Mr. Coston, 62 years old, arrives for his regular dialysis appointment with shortness of breath, chest pain and a BP of 100/58 mmHg. He states that he slept in a chair last night. His predialysis urea level is 40 mmol/L. The nephrologist has detected a pericardial friction rub. 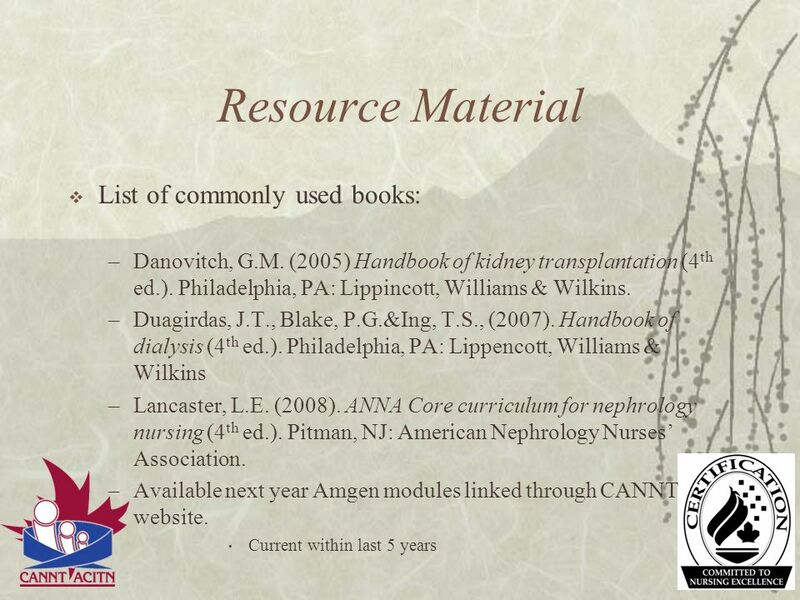 What should the nephrology nurse anticipate? 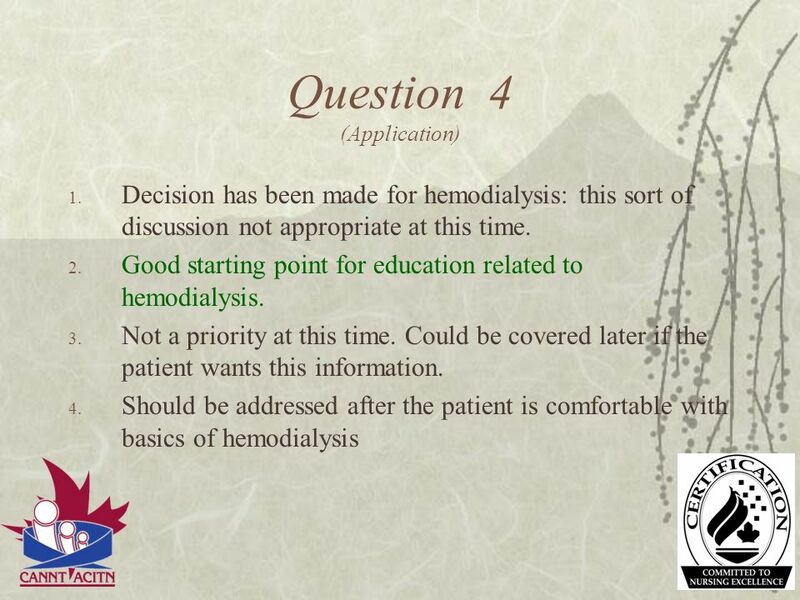 Consult the cardiology department and arrange for admission before initiating hemodialysis. Initiate aggressive hemodialysis after a chest x-ray to determine pulmonary edema. Initiate aggressive hemodialysis using minimal amount of heparin sodium (Hepalean). Delay dialysis until the electrocardiogram results are available. Mr. Coston is exhibiting manifestations of pericarditis and requires immediate hemodialysis with minimal heparin. This could be considered later. Hemodialysis is required. 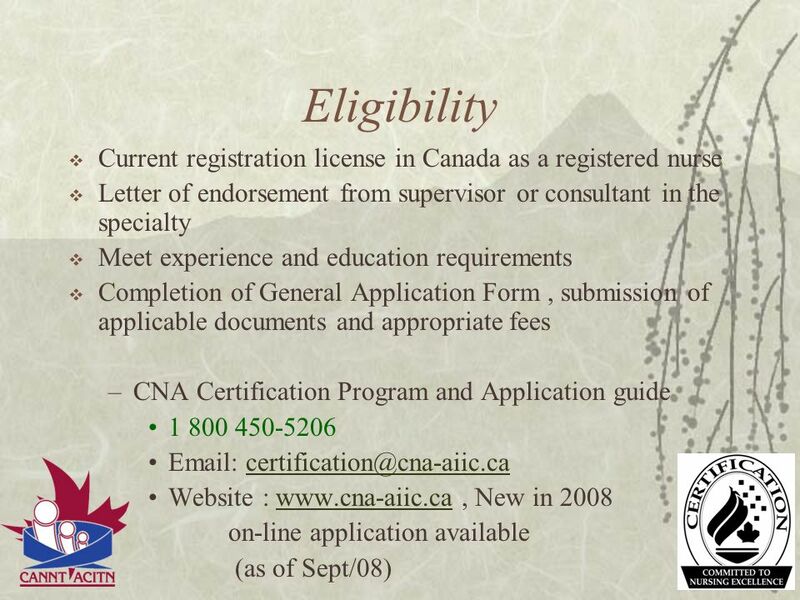 An x-ray can be done at a later date. Aggressive dialysis with minimal heparin is the most important plan at this time to minimize the symptoms of pericarditis. An ECG is not particularly helpful to determine pericarditis. 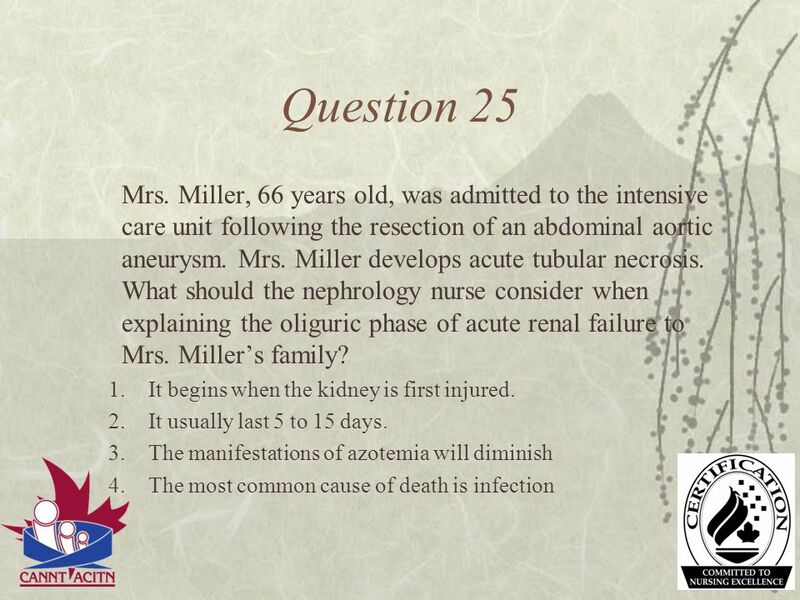 95 Question 24 (Knowledge) Correct answer. Decreased production of ammonia by the kidney. 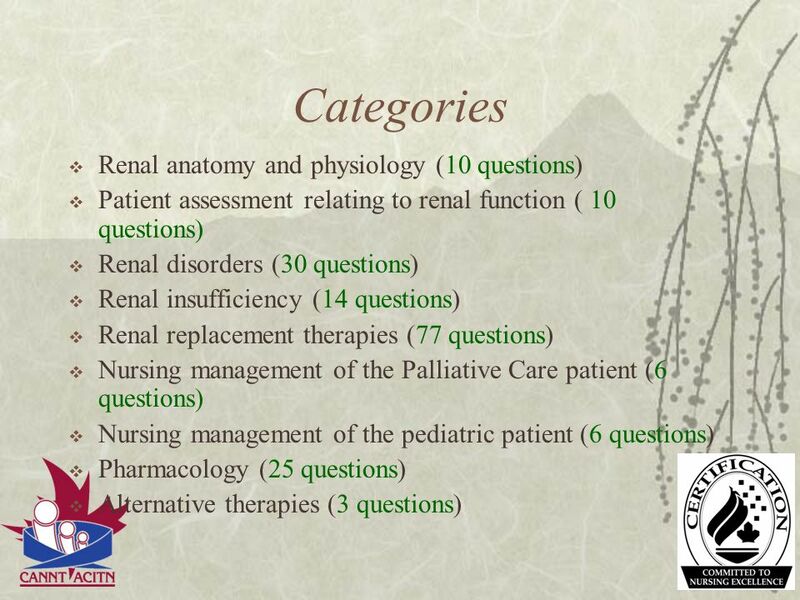 Not related to renal failure. It is not a cause of metabolic acidosis. 97 Question 25 (Knowledge) This is the initiating stage. Correct information. This is the diuretic stage. The most common cause of death is from cardiac arrest due to hyperkalemia. Institutions offering credit for certification Eastern Canada – Dalhousie, Memorial of NF, Moncton, St Francis Xavier, Central Canada- McMaster, Ryerson, Western Ont., Ottawa, Windsor, Laurentian, Sherbrooke, Lakehead Western Canada- Athabasca, Brandon, Thompson Rivers, UBC, Lethbridge, Northern BC, Sask., Victoria, and Okanagan College. 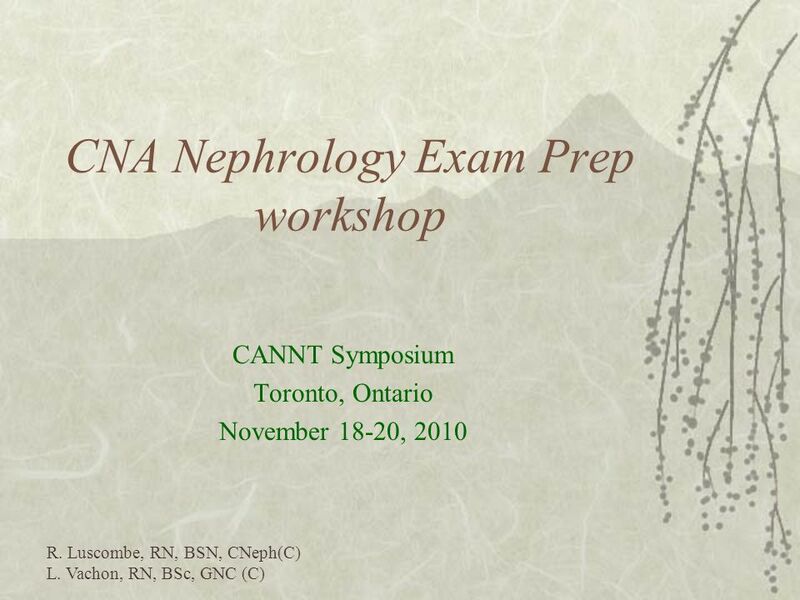 Download ppt "CNA Nephrology Exam Prep workshop"
ACSM AMERICAN DIETETIC ASSOCIATION DIETITIANS OF CANADA 2009. 1 Funded ICT Programmes & Qualifications 2008/09 Funded by Learning & Skills Council via Devon Adult Community Learning. 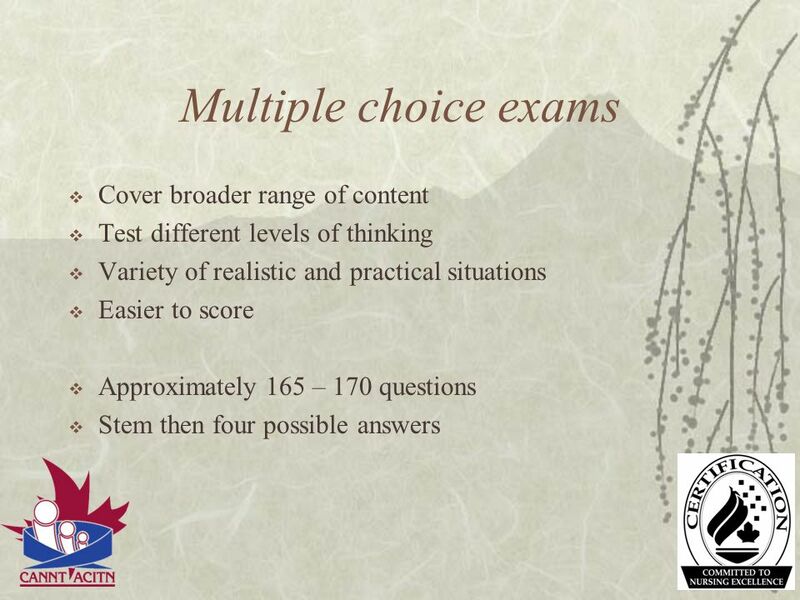 Success Planner PREPARE FOR EXAMINATIONS Student Wall Planner and Study Guide.